Mediator and Trainer Lee Jay Berman awarded the National Academy of Distinguished Neutrals' top honor at their 2017 Members Retreat in Toronto. Lee Jay has developed a sterling reputation for his mediation of... seemingly intractable cases, across North America. He brings those valuable insights from the mediation room to a wide range of audiences, including experienced neutrals. 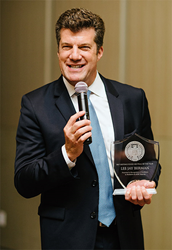 The National Academy of Distinguished Neutrals (NADN) is pleased to present their inaugural “Distinguished Neutral of the Year” Award to Los Angeles-based Lee Jay Berman, in recognition of excellence in mediation and ADR training. A nationally-renowned mediator, Lee Jay Berman began mediating cases full-time in the mid-90’s, successfully resolving thousands of cases over the last 23 years. An early member of NADN’s Executive Committee, Mr. Berman was also inducted as a Distinguished Fellow with the International Academy of Mediators, certified by the International Mediation Institute, and appointed as a Dispute Resolution Expert with the United Nation’s Development Program. He is a Master Mediator on the American Arbitration Association’s employment mediation panel and is on their national specialty panels for commercial and construction cases. He has twice been recognized for his mediation practice in California as a Daily Journal “Top Neutral”; Acquisition International Magazine awarded him “Mediator of the Year - California” each year since 2012, and he was voted by his peers into the Who’s Who of International Commercial Mediation annually since 2012. Mr. Berman honed his skills as a lecturer and trainer during his time as Director of the "Mediating the Litigated Case” Program at Pepperdine Law School’s Straus Institute for Dispute Resolution, a position he held for seven years. Lee Jay left Pepperdine to found the American Institute of Mediation, dedicated to providing “world-class training for the complete mediator.” In that capacity, Lee Jay has taught at Southwestern Law School, University of Texas, Southern Methodist University, Cal-State Northridge, UC Santa Barbara, and Bond University (Brisbane, Australia). In addition, Lee Jay has trained judges, attorneys and business leaders in India, Australia, Europe and the Middle East. As an author, he has published numerous articles on mediation, negotiation, and ADR, along with his blog ‘Eye On Conflict,’ and the ABA will be publishing two of his books in 2018. The award was presented to Mr. Berman at the 2017 NADN Members Retreat, held at the Four Seasons Toronto on Friday, August 18, 2017. The NADN Distinguished Neutral of the Year Award will be presented annually to an ADR professional widely considered by his or her peers to have achieved the highest of excellence in the dispute resolution profession.